There are certain moments in time that can change the trajectory of your life, your business or life as you know it. I was reminiscing this past weekend about how far we’ve come over the last 3 years and some key moments that allow us to be where we are. This is a Radix Origin Story that’s a key in the success we’ve had so take a sec to buckle down and enjoy. 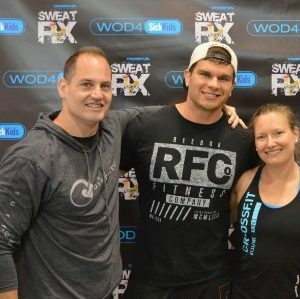 I started doing CrossFit in 2012 in Mississauga where Rach was the Head Coach and Manager. She taught me everything in those first couple years, we fell in love, got engaged, started a gym, got married, had a beautiful baby boy and it’s wonderful but that’s not the story for today. During my time at that CrossFit gym I made some good friends and a couple frenemies along the way, I never would have thought the impact that one friendship would’ve had on the Success of my families future business. Sometime in 2013 I started coming to the morning classes at CrossFit and I joined the Athlete development program and trained with that group twice a week, that’s when I met Nick K. aka ‘Lonely Nick’ aka ‘Ol’ Man’. There were a couple people in the AD program who I didn’t care for but Nick and I hit it off pretty good. He was a meat head who enjoyed lifting heavy, being loud and who had trained with my Muay Thai Kru and owner of Kombat Arts Joey in the past. Little did I know he was some local Real Estate Celebrity lol. In 2015 we opened up here where we are today and I was still programming all Nicks workouts and he decided to come join us in our new location full time. That one meeting in a TD Bank and that gut feeling to help a friend get better has turned into over 30 members here at Radix, 4 midday classes, 3 PT clients and multiple 12 week challenge participants. Between Nick his brother Tom and Mike D. more people have heard about what I’m doing here at Radix then I could’ve ever imagined. Don’t miss the small opportunities in life to make a difference, to reach out and help. I wasn’t doing anything spectacular and Nick paid me for the programming but in a moment of deciding whether or not to say something I did and it reaped major benefits to my future. Thank you Nick! Thank you Tom! Thank you Mike!